Our June gathering is our main event held on the land. We also offer a variety of ways in which you can visit and stay with us in Southern Oregon, or perhaps hold your own retreat or gathering here at Cedar Bloom. 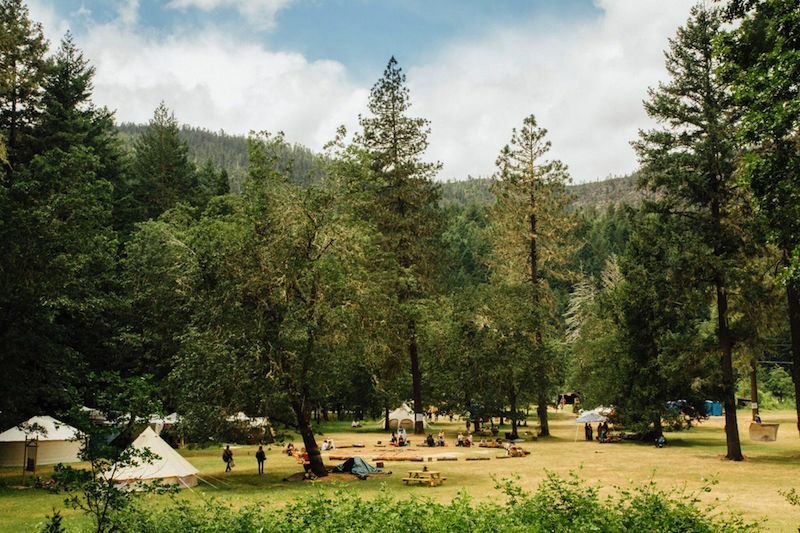 The campground at Cedar Bloom was voted 2018 staff favorite on HipCamp! The camp is located right on top of the Illinois river with a 1 minute walk down to our own private riverside beach and swimming. The camp is also just a 3 minute walk to the lands pristine swimming hole. Camp is a 1 minute walk to the main house, private commercial kitchen, bathroom, shower and outdoor bath. Cedar Bloom has available power and cell phone service. Cell phone service works great if you have AT&T or Verizon. Internet is limited but is available.We have several giant meadows with thousands of trees surrounding. We are right on the Illinois River with a mile of river frontage and 3 incredible swim spots. It’s a great place to come and recharge and renew. Cedar Bloom also has unique building and land features, including an Earth Cobb Bench, 16-foot AirCrete Dome built in collaboration with Dome Gaia, a beautiful hand-built reclaimed wood stage, a large composting toilet facility, and our very own Camp Store with special treasures and all your camping needs! To camp with us, visit our several listings on HIPCAMP! where we were voted 2018 staff favorite. Our newest additions to the land are available through AirBnB. These tiny A-Frame Cabins are a unique way to enjoy sleeping among the forest trees! The river is just a few min walk down to our own private beach and swimming. The cabins are super cozy at 1000sf, with an additional deck that is great for yoga or napping. They include two twin size mattresses and linen bedding. This camp is a 1 minute walk to the main house, shared commercial kitchen, bathroom, sauna and shower house. Cedar Bloom is an ideal place to host your next retreat, music event, or gathering! Please visit our events page for more information on how we can accommodate your vision!